Observa a los artesanos locales trabajando en un taller de vidrio de Murano. Situadas al otro lado de la laguna veneciana de Venecia, las hermosas islas de Murano y Burano son mundialmente famosas por sus artesanías tradicionales. Te reunirás con tu guía en el centro de Venecia para un corto viaje en bote a Murano, un pintoresco grupo de islas que ha sido el hogar de algunos de los mejores sopladores de vidrio artesanales del mundo desde el siglo XIII. Visite el taller de un soplador de vidrio local para ver cómo las formas delicadas toman forma desde el vidrio fundido a través de una combinación de laminado, moldeado con herramientas de hierro y soplado a través de un largo tubo metálico. Aprende trucos del oficio, como la forma en que se agregan minerales para dar a los jarrones de color caramelo y los candelabros de Murano su color vibrante. Disfrute de un tiempo libre en la isla para explorar otros talleres y tal vez recoger un recuerdo para llevar a casa. Súbase al barco para disfrutar de un paseo panorámico a Burano, donde se reparten los tradicionales talleres de costura en las coloridas casas de la isla. Conozca la historia del encaje de Burano y cómo fue buscada por los monarcas en toda Europa por su exquisita calidad. Tendrás la oportunidad de ver a las artesanas locales crear encaje a través de una serie de tejidos y costuras finamente detallados, siguiendo una tradición que ha prosperado aquí durante siglos. Si lo desea, visite el Museo del encaje de Burano por su cuenta para profundizar aún más en la historia de esta elegante artesanía. Disfrute de tiempo libre para explorar la isla y explorar las tiendas locales antes del viaje en barco de regreso a Venecia. First, our guide Lara is a wonderful person. She made this tour even better with her jokes. It was a wonderful and well organised tour. The Murano Factory was very nice and to see them make beautiful things out of glass was wonderful. They have a small store where you could buy some items. Burano was nice as well, as we saw how the lace was made and the technics in knotting. A nice small island with colourful houses. They are many shops to buy the lace work. We enjoyed the trip and our guide was very knowledgeable. The tour to the Murano glass factory was interesting to watch. The prices in their showroom were extremely high. There wasn't much else to view on the island. We would have liked to have more time at Burano. Interesting island with lots of shops in picturesque setting. Would like the guide to keep negative religious views to herself when speaking to the group; on a one on basis, it is not a problem. This tour was not quite what I expected. It was nice, but I thought we'd see a bit more of a demonstration of the glass blowing technique than we did. But it was good, just brief. The most of our time on Murano was spent walking to town and eating gelato in the town square, which was pretty. The lace making was interesting. I didn't know that each lace maker know one stitch and that is all she does, then the piece is passed on to the next lace maker to do her special stitch. Such beautiful pieces! The colorful homes on Burano were really fun to see! Take the time to walk to the canal, your guide will show you the way. There were many cute shops there to browse. The boat ride was lovely. Our guide was helpful and very nice. It was a slower paced tour than some of the others we went on, but we enjoyed it. Like the review title says, "a very nice afternoon out". 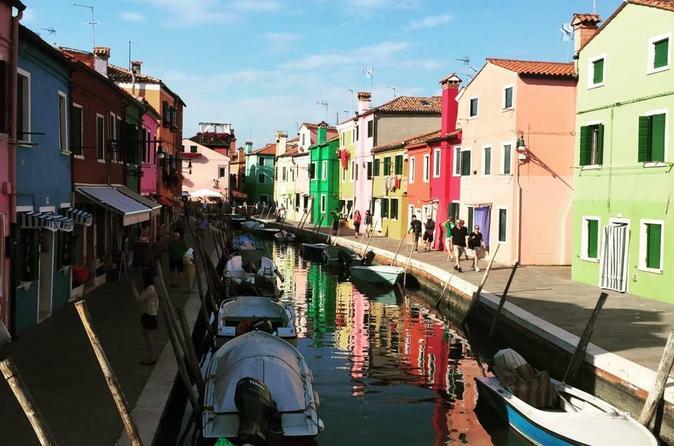 Murano and Burano are picturesque and interesting little islands worth the side trip from Venice. But just take a ferry and do it on your own. The tour was not as described, just money grabs. Glass making demo lasted 8 minutes at best then straight to their store. Lace making demo was 1 minute at best and straight to their store. Thanks to Jennifer our lovely guide, we thoroughly enjoyed the boat trip to both murano and burano. Jennifer was very informative, friendly and approachable - we even asked her some questions at the end after everyone had left and she made the effort to talk to us for a while. It was a brilliant experience! Great if you've never been to Venice and want a glimpse into the unique beauty and history of these islands. Can't get over the wonderful colours of all the houses in burano!!! Was well organised, fun, and great to do as a first time trip to Venice. Our tour began with a short boat ride to the island of Murano. At the glass factory we were given an up close view of the glass blowers working in the factory. We saw two different demonstrations of glass objects being created. After the demonstration we visited the museum and gift shop and saw outstanding works of art that were mouth-blown in this family-run factory. From here we went to the island of Burano. In Burano, we were escorted to a quaint shop and shown how the lace is hand-made. We were able to look through the store and purchase beautiful hand-crafted items if we wished. We had some extra time to explore this colorful village. We also stopped for gelato and visited a lovely church. On the way back to Venice, our tour guide gave us additional information about Venice and other surrounding islands. We enjoyed our tour very much. We loved our tour guide Manuelita. She was very knowledgeable about the history but also told us many fun extras. The islands and demonstrations were wonderful. 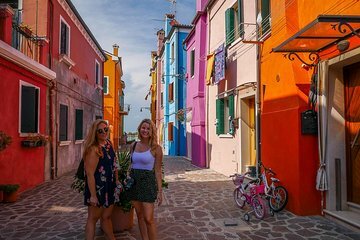 Walking the streets of Burano is a must! This tour was excellent and gave us enough time on both murano and burano to see some local sights. The glass blowing demo was maybe 20 minutes on murano. The lace demo on burano was much shorter. Burano was really interesting to see. The house colors are splendid, yet it’s a quiet island without crowds. The boat ride was fun and Alessandra was very knowledgeable about the lagoon, marshes, all of the islands, and she gave great description about how Venice was built. This tour was excellent and gave us enough time on both islands. We recommend it. Excellent tour! The glass making shop we saw in Murano had the most exquisite pieces on display! No pictures allowed though, sadly. I've visited the Corning glass museum in NY and the Chihuly glass museum in Seattle, and some of the pieces at the Murano factory were even better! Burano was also a really neat island to explore. The colorful houses were beautiful. Our guide, Antonella, was also very nice and knowledgeable. She told us so much information about all of the islands on the boat ride! Definitely a great way to explore the islands around Venice.